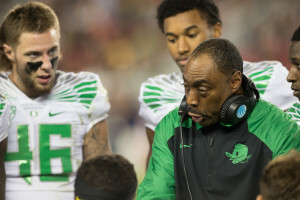 With a new season just around the corner, a new Oregon team is about to emerge. The new players are now in the swing of spring practice and the veterans are ready for one final run as Ducks. A new quarterback, offensive line, secondary, and highly-ranked incoming freshmen for various positions are a lot to take in. So here is one name on the defensive side of the ball to keep an eye one in 2015 and who will be the next great Oregon linebacker, Danny Mattingly. Danny Mattingly before the Civil War. In 2013, Mattingly was a 4-star athlete coming out of high school in Spokane, Washington. Standing 6’5 and weighing over 230 lbs, he was the second-ranked player in the state and redshirted the 2013 season at Oregon. Last year, Mattingly didn’t play until the UCLA game, which was a week after the Ducks loss to Arizona. Here is the Alonso comparison: As a freshman with 12 games in 2009, Alonso recorded 16 tackles and 1 forced fumble with no sacks or interceptions. Meanwhile, in only 11 of Oregon’s 15 games last season, Mattingly recorded 19 tackles, 1 sack, 1 interception and 1 forced fumble. Alonso ended his career by finishing his senior season with 81 total tackles, 4 interceptions, 1 sack and 7 pass breakups on his way to becoming a second-round pick in the NFL Draft in 2012. This is not to say anything is for certain, but Mattingly’s freshman stats is an early indicator of promising future. Mattingly (46) listens to Don Pellum on the sidelines. Bonus points for the mullet. Mattingly quickly showed an ability to diagnose what the offense was doing and make a play on the ball — something Alonso excelled at as a Duck. The coaches took notice, too, and Mattingly saw significant snaps in the national title game where he recorded an interception and 2 solo tackles. Now, with Derrick Malone and Tony Washington gone, there are more snaps to go around. 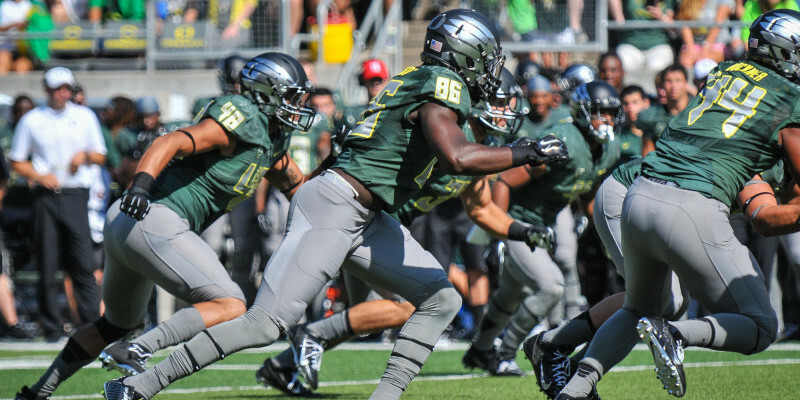 Seniors Joe Walker, Rodney Hardrick and Tyson Coleman are the most experienced linebackers in the rotation, add Torrodney Prevot to the mix and the Ducks should have a solid starting group in 2015. Right now, it’s unclear where exactly Mattingly will fit in the rotation – there are older players in front of him — but his talent might force the coaches to keep him on the field. 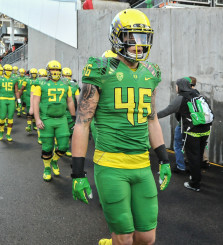 The Ducks have a perfect mix of players at linebacker in 2015; young talent eager to show their skills and experienced senior leaders able to show them how to be Men of Oregon. Mattingly has the perfect combination of size, athleticism, and football IQ to be an excellent linebacker. If he continues to learn from the seniors and make plays on the field, there is no doubt that he will live up to his hype. Look for him to open many eyes this season.